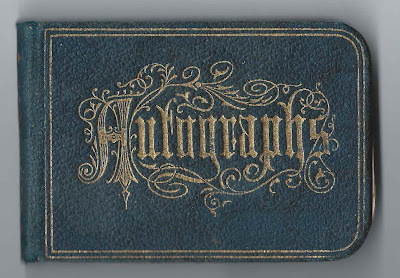 1870s/1880s autograph album presented to Bell Cole of Hampden, Maine, by her teacher E. B. Towle. The album measures approximately 4" x 1-3/4" and contains the sentiments of 30 of Bell's teachers, schoolmates, friends and relatives. The 1880 Census of Hampden, Maine, includes an Isabel O. Cole, age about 14, in the household of Daniel B. and Helen A. Cole. The 1870 Census has an Ora Cole, age about 4, in the household of Daniel and Helen Cole. One irksome detail is that in the 1880 Census referenced above there's a Dora E. Cole in the household, called a daughter, as was Isabel. 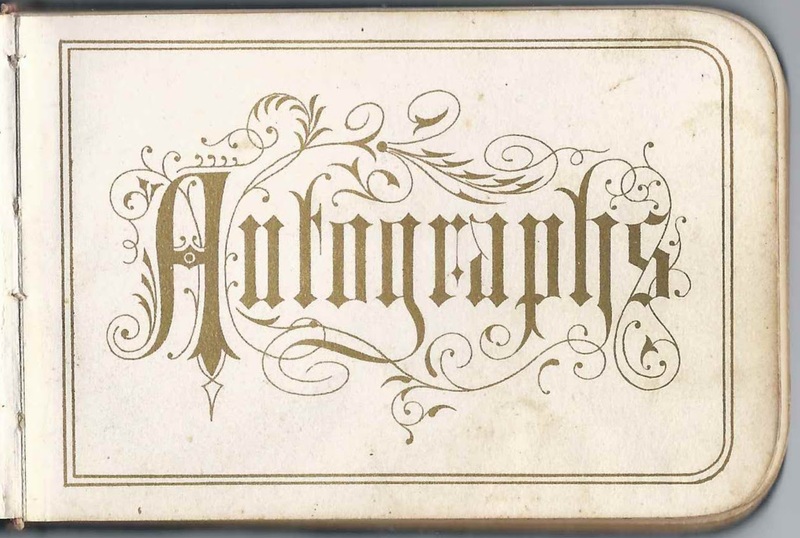 However, there's a page in the album signed by a Dora E. Cole who called herself Bell's cousin. 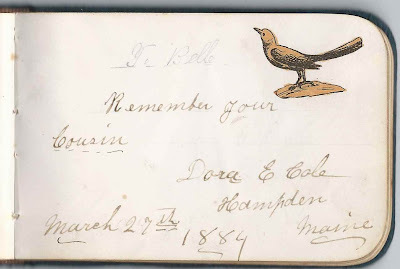 Perhaps Dora was a niece of Daniel B. Cole. It's possible she was Dora Eliza Cole, the daughter of John and Eliza R. (Harding) Cole, and perhaps her parents were unable to care for her. 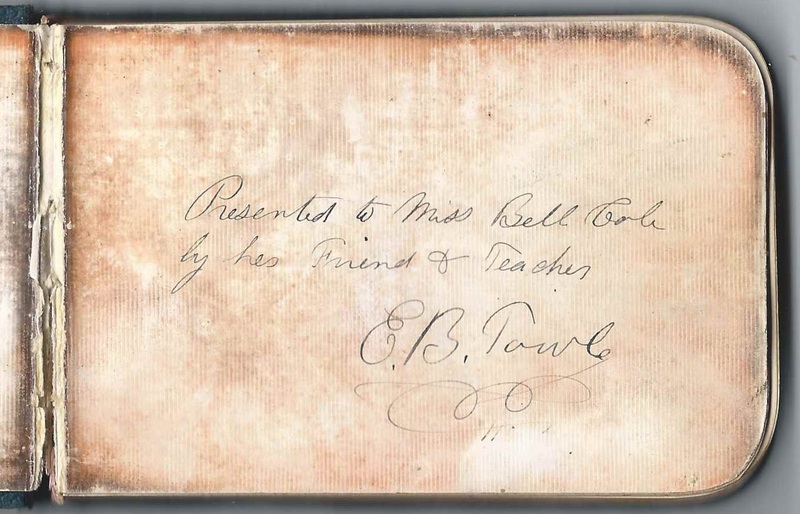 Despite the problems above, I think that Bell was actually Ora Bell Cole [or Ora Belle Cole], born 29 February 1866, to Daniel B. Cole and Helen A. (Wheelden) Cole. 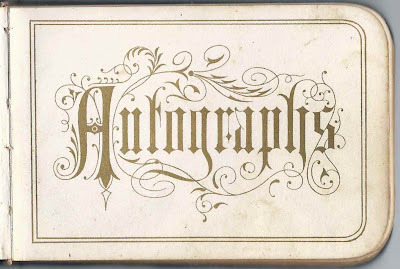 As if there weren't enough confusion with the name already, Ora Bell Cole is enumerated as Laura B. Cole in the 1900 Census of Boston, Massachusetts, where she and her brother Horace, a hay dealer, were living in the household of landlord Thomas J. Chesley. 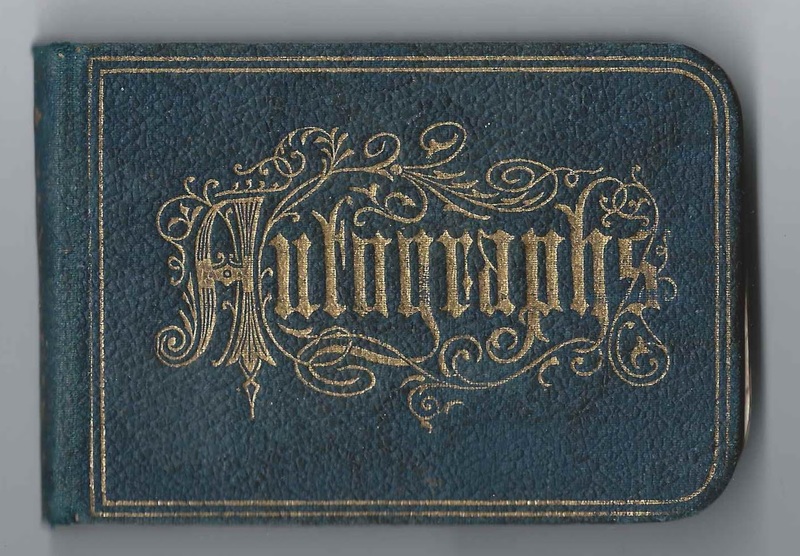 A little over a month after the June Census enumeration, on 31 July 1900 at Boston, Massachusetts, Ora Bell Cole married Thomas J. Chesley, son of Thomas and Susan (Croxford) Chesley. 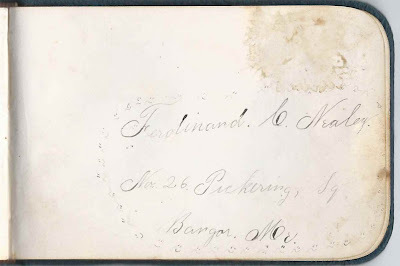 Thomas, Jr., was born about 1829 at Durham, New Hampshire. Sadly, Ora Belle (Cole) Chesley died several years after her marriage, on 11 March 1904, of Bright's Disease, complicated by pneumonia. Widower Thomas died in 1908. If you have corrections to the information above, especially if you believe that album owner Bell is not Ora B. (Cole) Chesley, please leave a comment or contact me directly. Thanks! Ferdinand C. Nealey of No. 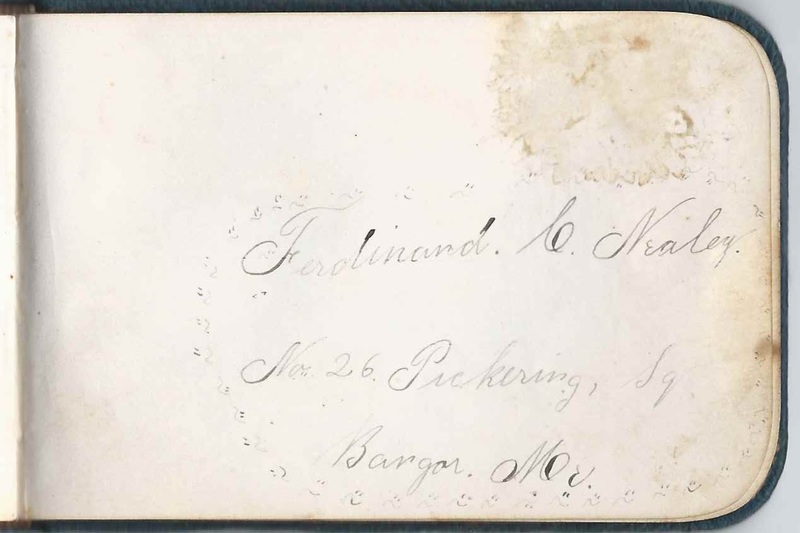 26 Pickering Square, at Bangor, a noted photographer, signed a page. See another post for a photograph, perhaps a self portrait, of Ferdinand Cortez Nealey.